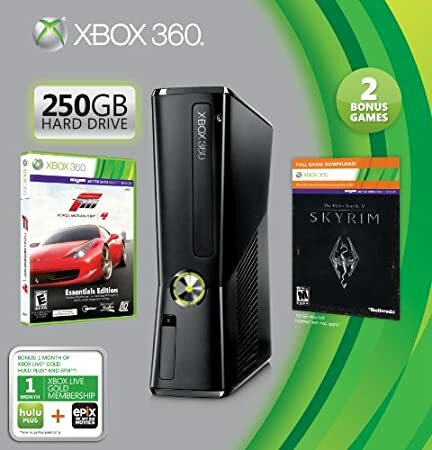 Xbox 360 250GB Holiday Value Bundle (Amazon exclusive Bonus Value) | Your #1 Source for Video Games, Consoles & Accessories! Xbox 360 has more ways to play, and now for a limited time get two free games and a one-month trial for Hulu and Epix. With the largest portfolio of games to choose from, there’s something for everyone — from classic titles to the biggest blockbuster games. The spacious 250GB hard drive gives you the space you need to store arcade games, movies, demos, and even full Xbox 360 games. Plus, with built-in Wi-Fi, it’s easy to connect to Xbox LIVE to access tons of great entertainment — from HD movies and TV shows to live sports. The 5 digital games included are: Aqua, Lode, Runner, R Type, Snoopy, The Maw.